3D Hubs announced today that they have partnered with SketchUp and Flashforge to create the Make It Functional Design Competition for designers to showcase ways in which 3D printing can change our day to day lives through functional design. 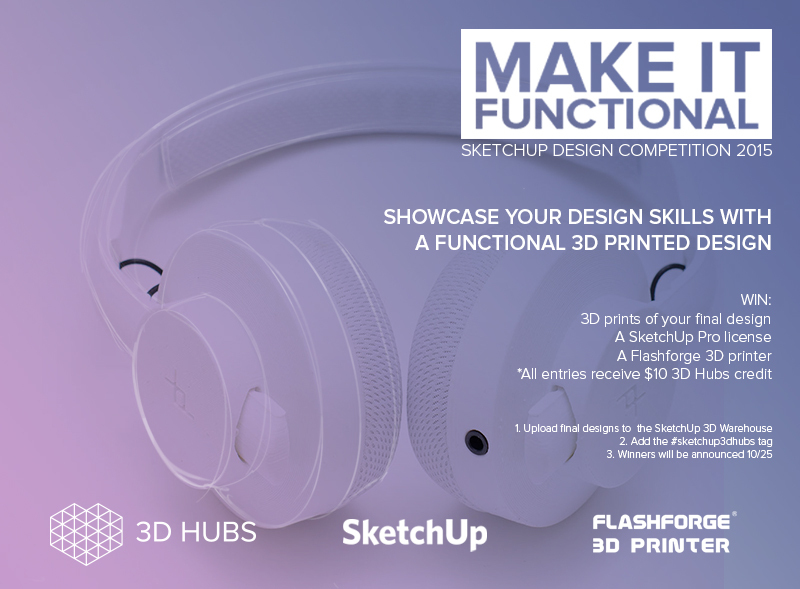 Everybody who enters will receive a $10 3D Hubs voucher to put towards making their idea real, and also has the opportunity to win one of two Flashforge 3D printers and a SketchUp Pro license. Although the earliest methods for 3D printing – also known as rapid prototyping – first became available in the 1980s, a significant amount of that work was done for creating prototypes of products that would be manufactured through more traditional methods – such as injection molding. With the rise of desktop 3D printers within the past decade however, this same technology that was once used for creating prototypes has increasingly become used for creating the actual objects themselves – including everything from self-watering planters to headphones, desk organizers and more. The purpose of the Make It Functional contest is to highlight these useful everyday objects and encourage both new and seasoned SketchUp users to “make their designs real” with 3D printing through 3D Hubs. SketchUp users entering the contest with a product design concept that they think is useful for everyday life can upload their file directly to the SketchUp 3D Warehouse before October 25, 2015. Once uploaded, the “I want this to be 3D printable” button should be checked and the model should be tagged with #sketchup3dhubs. Entries will be judged on innovation, usefulness and printability with regard to their use as everyday objects. All entries on 3D Warehouse will be given a $10 3D Hubs print voucher to kickstart their functional designs. Note: only contest entries that are submitted by the October 25, 2015 deadline will be eligible for the prizes and the $10 3D Hubs print voucher. 3D Hubs is world’s largest and fastest growing network of 3D printers. By connecting everyone to nearby 3D Printers, 3D Hubs is accelerating a future of local and on-demand production. Our network consists of 16,000 printing locations worldwide, providing over one billion people access to a 3D printer within 10 miles of their home. For more information, visit: www.3dhubs.com. At SketchUp, we do our best to make great tools for drawing. For our users, drawing is thinking. They draw to explore ideas, to figure things out, to show other people what they mean. They draw because they love it, and because nothing great was ever built that didn’t start with a great drawing. SketchUp users are architects, designers, builders, makers and engineers. They are the people who shape the physical world. They are important, and they deserve great tools because great tools produce great work. Flashforge is disrupting the desktop 3D printing market by introducing easy-to-use 3D printers. Established in 2011, Flashforge has sold over thousands of 3D printers worldwide, including the award-winning Creator with dual extrusion. Flashforge focuses on making 3D printing widely accessible to institutions, architects, engineers, designers and the broad consumer and prosumer market. Flashforge is fully committed to creating value for its customers by delivering quality, reliable, competitively-priced products and going beyond the Flashforge Promise.